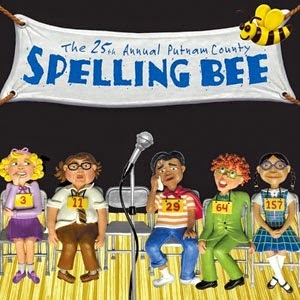 The bright and charming musical about the successes and failures of kids competing at a spelling bee -- The 25th Annual Putnam County Spelling Bee -- is back in Normal this week, as the summer musical for Normal Parks and Rec. This version of the Bee opens tomorrow, outside at the Connie Link Ampitheatre off Linden Street in Normal, with performances through June 22. Tickets are $4 for adults, $2 for students from kindergarten to high school age, with free admission for those under 5 or over 65. Bloomington High School's Susan Cortesi directs a cast that includes Amelia Dirks, Brendan Donnelly, Anna Genrich, Will Koski, Leah Overmier and Hayden Wood as spellers and Kira Haney, Elizabeth King and Ethan Schlenker as the folks running the competition. No word on whether this production will continue the tradition of pulling guest participants from the audience, but I don't know why they wouldn't. One thing is definitely different from previous Bees -- director Cortesi has gone with a larger cast rather than using a small ensemble in multiple roles. This time, the Bee will have a cast of about 28. Tomorrow night's performance is scheduled to begin at 7:30 pm, but you are wise to get there early to stake out a good spot on the lawn. For more information, click here to see the event's Facebook page.